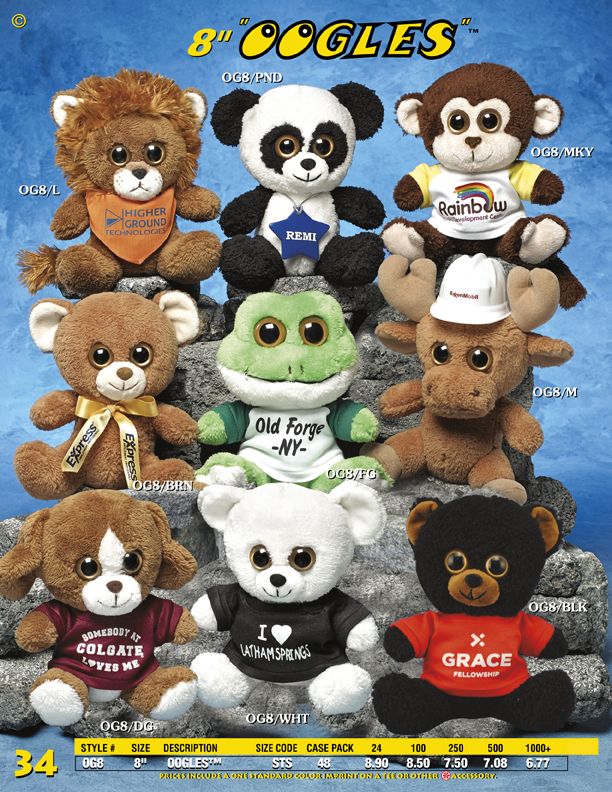 Catalog Page 34 - 8" Oogles Family of stuffed animals with large crystal eyes. The 8" Oogles Collection includes stuffed animals with large crystal eyes. These oversized eyes make these animals cute and cuddly. Choose from a lion, panda, monkey, dog, white bear, frog, brown bear and moose. The lead-time for production is 10 - 14 days. Pricing includes the printed t-shirt, ribbon or bandana. Set-up charges apply. The minimum order is 24 pieces. We show the "case pack" (quantity packed in a box from the factory) for shipping purposes. You can mix-up animal styles and shirt colors for no charge as long as the logo remains the same color on all shirts. In addition to bears with T-Shirts, we also offer printed accessories including hats, scarves and ribbons. If you order more that 2,000 pieces, we can custom manufacture embroidered teddy bears or stuffed animals, instead of using a t-shirt. We have over 40 years of experience manufacturing stuffed animals. Send us your design today.